After a quick early morning look at the new May J.Crew arrivals, I ordered a few items that immediately caught my eye, including the No. 2 Pencil Skirt in Paisley and the Cotton Off-The-Shoulder Top in Stripe. I was excited to finally see a cotton printed pencil skirt (and at a reasonable price point!) in the latest rollout. With the regular length showing a measurement of 25″ (hooray!) I ordered the regular length in this skirt and decided on my regular size 12 due to the cotton/elastane mix. I have had to size up with the non-stretch skirts of late, but most of the J.Crew cotton pencil skirts in my closet are a size 12. I also have the Short-sleeve Popover in Stripe and will try that pairing as well, similar to the website styling. The fit on this is perfect so I’m pleased to say it is true to size – the waistband hits at the higher end of the waist, and I’m thrilled that it actually hits at my knees (I’m 5’8″). The cotton is a textured cotton and lined with what I’m guessing is polyester (the tag doesn’t specify). I personally don’t mind the poly lining as I’m not usually wearing these types of skirts anywhere but work in the summer time. I know some of my older cotton pencil skirts are either unlined or lined with cotton. Overall, bravo, J.Crew. Please make more skirts like this! 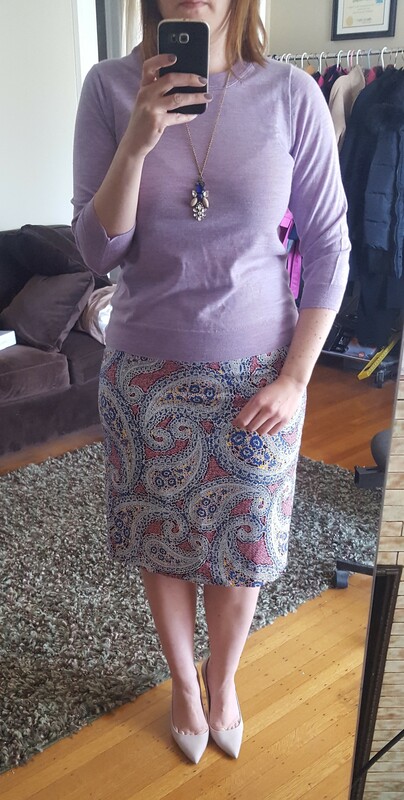 Here’s the skirt with a (slightly wrinkled) lavender Tippi sweater. Next up, the Cotton off-the-shoulder top in stripe. I wasn’t necessarily waiting for these tops to come out, as others were, but I like the look on others, and I was looking forward to trying a new silhouette for summer. I ordered the 12 and 12 Tall in this top, as I was worried about the top being too short. the 12 Tall ended up being a bit too long and large, so the regular 12 is the right size for me. 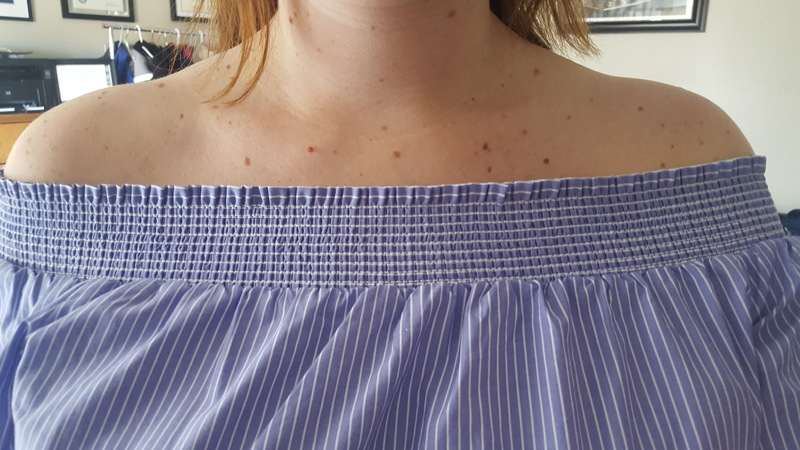 Before I pulled the shirt down off the shoulder, I could see thinking it was too short, but…since this is an off-the-shoulder top, the length is just right. The cotton is lightweight shirting material, similar to the cotton popover I referenced earlier. Talk about an easy go-to summer outfit! There’s something to be said for a good collar bone. I didn’t play around much with jewelry, the pendant I tried looked awkward but when I tried it on yesterday with a simpler necklace, I liked that look. However, I don’t think a necklace is a must with this type of top, some fun bracelets may be the way to go. Here’s another shot from the side. I don’t think I’d go down another size in this top, so I’ll say it’s true to size. The only thing I’m not totally looking forward to is having to pull out the strapless bra to wear with this top. But, like I said, it’s a different shape than we’ve seen in the past few years for summer tops so I’m looking forward to switching it up a bit. So, these were two wins from the latest rollout. Have you tried either of these items? Would love to hear what you think and thanks for visiting! 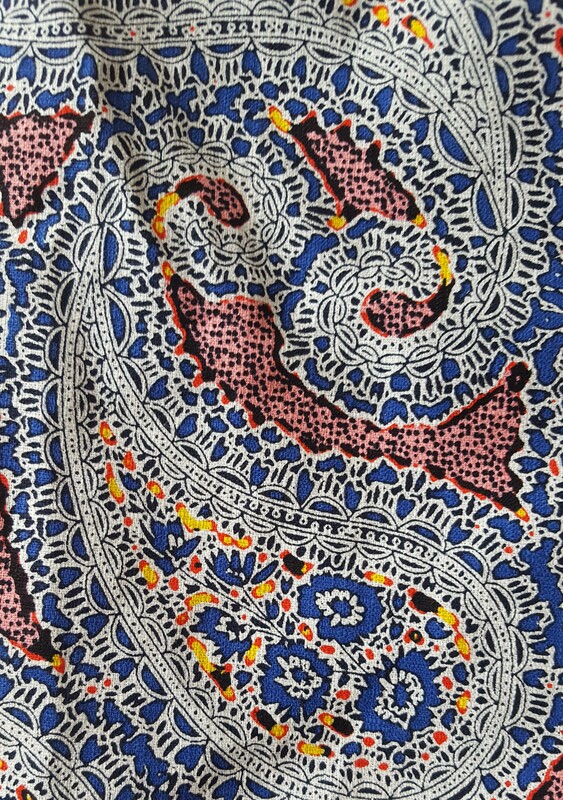 I just got the paisley skirt in the mail today and I was expecting a more muted color palette. Regardless, I am excited about this skirt and looking forward to wearing it. J Crew pencil skirts always gets me.